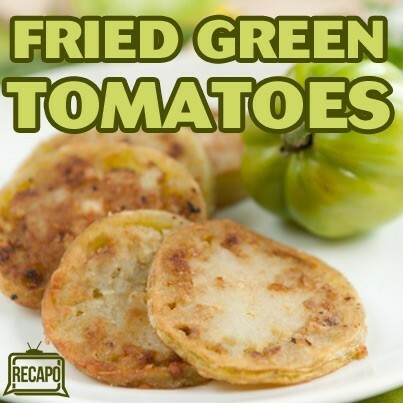 For those with a taste for Southern delicacies, Fried Green Tomatoes is more than just the name of a classic movie. It’s also a beloved dish, and Michael Symon’s version on The Chew contains Crab Salad. Check it out. You don’t want to let the final days of summer go by without indulging in a few more satisfying meals. The trick to this is spicing up the flour in a classic egg wash. This is a great way to use leftover tomatoes that you have going into the fall, because Michael Symon said there are always more tomatoes than you can really use while they are still good. If you are deep frying these, be sure to keep extra oil on hand. Adding more oil will help you bring the temperature down if it gets too hot while you are cooking. The Chew crew agreed that this recipe was to die for! As summer draws to a close, what are you going to do with those tomatoes? Try this Fried Green Tomatoes recipe from The Chew, with crab salad! Preheat oil in a deep fryer to 350 F.
Season tomatoes with salt and let rest for 10 minutes. Combine flour with paprika, cayenne, salt, and pepper in a shallow dish. In separate shallow dishes, place eggs and panko. Dip tomatoes in flour, then eggs and breadcrumbs. Gently shake off excess breading. Add tomatoes in batches to the fryer, cooking to a crisp. This takes two or three minutes per batch. Let rest on paper towels. Combine yogurt dressing ingredients and refrigerate until ready to serve. Stir together crab salad ingredients, seasoning with salt and pepper to taste.